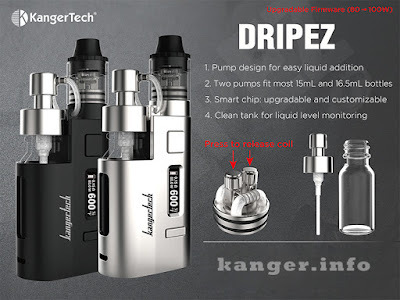 Drip EZ Kit consists of the Drip EZ RBA and Drip EZ Mod, it features a e-liquid pump which is placed on top of the included bottle. A tube connects directly from the pump to the DRIP EZ RBA which allows e-Liquid to be delivered directly into your cotton. Drip EZ is powered by a 18650 High Amp Battery (Not Included), and you can charge it via the Micro USB port.It The DRIP EZ mod features a variable wattage output from 5 to 80 watts and also supports Nickel 200, Titanium and Stainless Steel wire in temperature control mode.